A Centifolia dwarf shrub. It has pink flowers, very small and full, form compact, almost scentless, growth habit erect on a dwarf shrub. [Gore, Rivers (1854, 1857, 1863), Paul (1848, 1863, 1888, 1903), Willmot]. 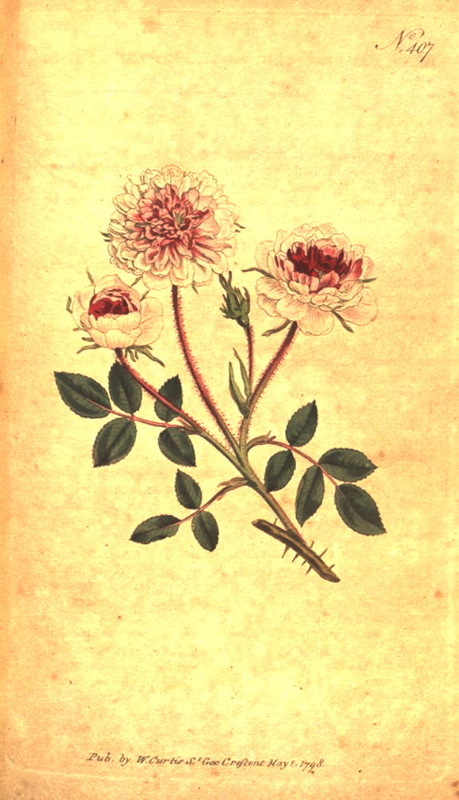 Thomas Rivers commented: ‘The Dwarf Provence Roses, Rose de Meaux, and the Pompon rose, are among the oldest of our garden roses, and known by every child brought up in a garden, as they are “so early and so pretty”.’ Rivers is clearly separating Rose de Meaux and the Pompon rose as different varieties. With the latter he may be referring to the ‘White de Meaux’, also known as ‘Rosier de Pompon’, a form with white flowers with pink centres. 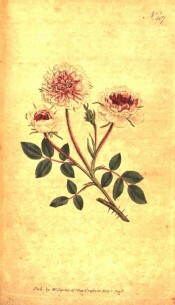 It was figured in Curtis’s Botanical Magazine as Rosa Provincialis var. ‘Pompone Rose’. ‘The flowers are smaller than those of any other double rose, generally of the size represented on the plate, and particularly distinguished by the brilliant colour of the eye or central petals; a flower of this sort just on the point of expansion is superlatively beautiful. […] the roots should not be divided oftener than once in three years; if the old wood be cut down every year, after the plant has done blowing, this rose will throw out more vigorous shoots and blossom more freely.’ [BM t.407/1798]. Described by a number of authors as introduced into England by Sweet in 1814, although certainly pre-1789. Although not listed in the 1843 catalogue it was mentioned, the name attched in apparent error to Rosa cinnamomea. The words ‘with many others’ were written after ‘Rose De Meaux’ in the 1845 catalogue and it was listed in the 1850 and 1857 editions [T.874/1845].